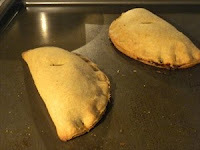 I just made wholewheat shortcrust pastry and pasties with said pastry and frankly I'm stunned! The pastry is light, crumbly, and a little crunchy. For the filling I used some caramelized onions which I cooked down over 24 hours in my crockpot and added steamed organic veggies and a strong cheddar from the store. While I don't think I'd win many awards for appearance, the result is one to be proud of. I listened to my Mother's advice when it comes to pastry and, well as always, Mother knows best! Next time I roll the edges of the turnover like an old Cornish lady. Meanwhile Tom, being from Jersey thinks a British pasty could be improved by deep frying like a Panzarotti. Ychafi! More on pasties later. For now I gotta nap. I'm so overwhelmed at my pastry!